July 9, 2013.- In the first half of 2013, the electricity demand in the main southern European countries has been defined by the current situation of economic crisis, which has led to year-on-year declines in electricity consumption in countries like Spain and Italy. Moreover, in countries like France and Great Britain, the demand in the first half of this year has increased compared to the same period of last year, mainly due to the low registered temperatures, especially in March, which were among four or five degrees below those recorded in the same month of last year. 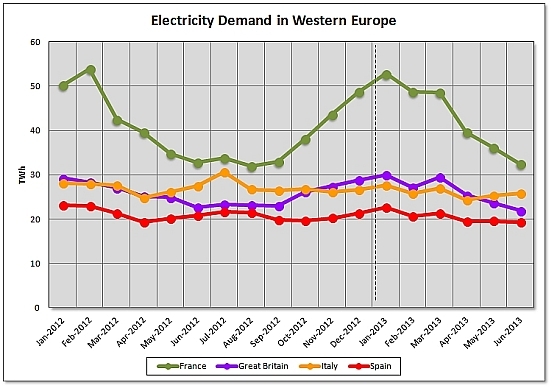 Monthly evolution of the electricity demand in Western Europe -2012 and the first half of 2013- (TWh). Data sources: France – RTE, Great Britain – National Grid, Italy – TERNA, Spain – REE. In Spain, the demand in the first half of this year has been 3.3% lower than during the same period of 2012. Once corrected by working days and temperature-related effects the drop has been of 2.7%. In the second quarter of 2013 electricity consumption in Spain has declined 3.3%. On the other hand, the Spanish economy has recorded a fall of 2.0% in the first quarter of this year compared to the same quarter of last year. In the case of France, in the first half of this year, the electricity demand has increased by 2.3% on a year-on-year basis. In the second quarter, the demand has been 0.9% higher than in the same quarter of last year. Moreover, in the first quarter of 2013 French economy has contracted 0.4% on a year-on-year basis. In Great Britain, the electricity demand has grown 0.7% in the first half of this year on a year-on-year basis. However, in the second quarter of 2013 the demand has been 2.5% lower than during the same quarter of last year; this behaviour has been justified by the increase of the prices in the wholesale electricity market in the UK. In the first quarter of this year, the United Kingdom GDP has been 0.6% higher than in the same quarter of 2012. The electricity demand of Italy in the first half of this year has been 3.4% lower than during the same period of last year. In the quarter just ended, the demand has fallen 3.9% on a year-on-year basis. Meanwhile Italy’s GDP has contracted by 2.3% in the first quarter of 2013 compared to the same quarter of 2012. AleaSoft forecasts that the electricity demand in Spain in the second half of this year will grow 0.4% over the same period of last year. 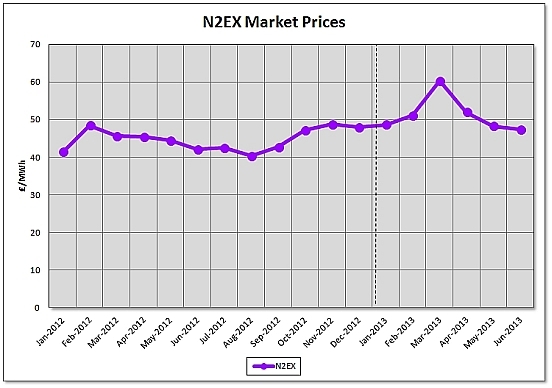 Given this forecast, at the end of 2013 the demand will be 1.5% lower than the one in 2012. To make these forecasts AleaSoft used a GDP scenario which expects that the Spanish economy will contract 1.3% this year 2013 and a mean temperatures scenario. In the case of France, the demand in the second half of this year is expected to grow 1.7% on a year-on-year basis. At the end of this year, the French electricity demand in 2013 will have grown 2.0% compared to the one in 2012. The forecasts have taken into consideration a mean temperature scenario and a France GDP scenario which estimates that the economy will contract 0.3% in 2013. 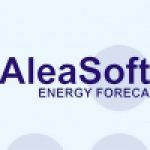 For Great Britain, AleaSoft forecasts that the electricity demand in the second half of 2013 will be 0.3% lower than during the same period of last year. 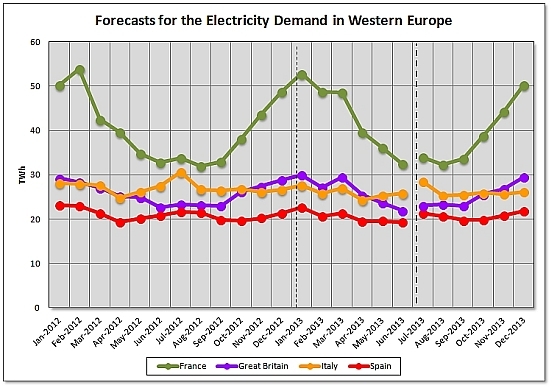 In 2013 the electricity demand will be 0.2% higher than in 2012. These forecasts have been made using a United Kingdom GDP growth scenario of 0.8% for 2013 and a mean temperature scenario. Besides, it is expected that electricity demand in Italy will continue to decline during the second half of 2013, which will record a fall of 3.9% on a year-on-year basis, closing the year with a decline in annual demand of 3.6% compared to 2012. The used GDP scenario predicts that the Italian economy will contract by 1.8% in 2013; in the case of temperatures AleaSoft used a mean scenario.